Part of (the only designed part of) "The Mighty Ascension of Jack"
I'm playing with the idea of making a big final level for my "Jack is a Fool" thing. Now - it's still my intention that what I release will be only about half an hour long, and only a fairly short game from which I can figure out whether its fun, and probably release it as freeware. It won't have graphics that it would if I turned it into a longer commercial indie game. But anyway. I digress. Big final level. Portal has a phenomenal final level. In it, you use all the puzzle solving techniques you've used throughout the rest of the game to be able to finish a big epic amalgamation of the puzzles. Something nice and final. I think the idea of ascending to the surface in Portal 2 is brilliant too, and feels good. 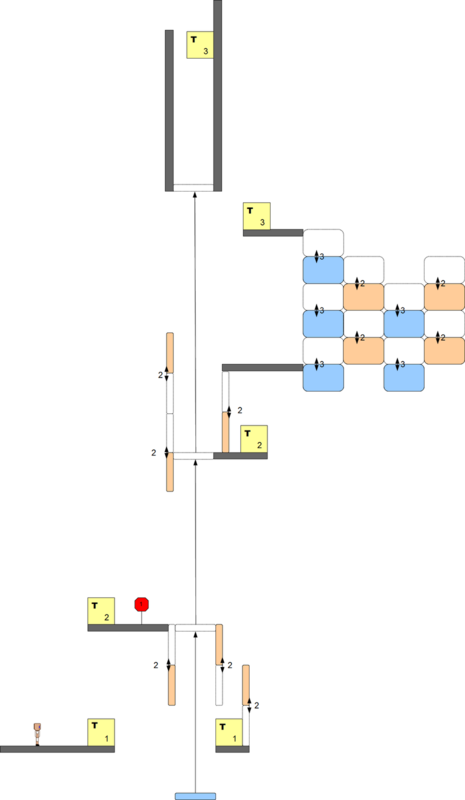 So - I've been thinking of combining the few styles of puzzles I'm using into one big final level that will have hopefully interlinked puzzles, a couple of checkpoints and something that will hopefully feel like a satisfactory finish even if the game is somewhat short. So far, I've designed the grand total of what you can see above. 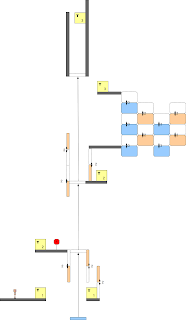 In reality, it's about a third of the length as I'd like it to be, and currently has about 3 puzzles in it - linked by the big lift in the middle. I think, once I've finished designing it (at least to some level I'm remotely happy with), I'll call my "designs before programming" a day, and start working towards making them work.